A new report suggests consumers are ditching cheaper, phone-based options for more powerful, tethered units. The news points towards the appetite for superior and immersive graphical experiences, which ultimately should lead toward dedicated, location based experiences. The market report by CCS Insight highlights that after the initial surge in sales of smartphone-based VR such as Samsung’s Gear VR, peaking at eight million in 2017, the numbers have nose-dived to a mere three million this year. Tethered VR headsets, like Oculus Rift, HTC Vive and Sony’s PS VR have seen better numbers and the reports believes these more substantial platforms will outperform the budget offerings with predictions of five million units in 2019, up to 18 million in 2022. Like much consumer technology, wires are a burden and cable-free options are predicted to see sales soar in 2019 with 29 million examples of the Oculus Quest and the cheaper Go expected to ship in 2022. The report reckons combined VR and AR shipments will increase to 52m by 2022. Cost will of course be the limiting factor to the average person and it is likely that only hard-core gamers will become adopters of such pricey tech. This leaves a large number of curious consumers with only a burgeoning number of location based experiences to satisfy the urge to experiment. 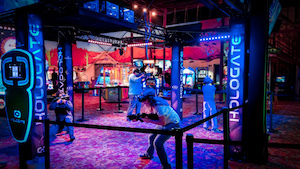 With the content proving so much more immersive and satisfactory on these higher-end platforms, plus the explosion in experiential leisure venues and the myriad of headset-based offerings at the recent big expo in Orlando, the virtual future is looking bright.